So often thoughts of fall put us in the mood for something sweet. The general buzz around the Pumpkin Spice Latte seems proof enough of that. There’s just something about the flavors of pumpkin, sweet potato, pear, and apple that sound not only delicious but also comforting. I have loved sharing some of my favorite baked sweets from our fall publications, including the Apple Galette from Paula Deen’s Fall Baking and the delicious Pineapple Upside Down Cake included in our Skillet Desserts cookbook. When it comes to fall recipes, however, I think sweets are only half the story. The flavors of the season truly come alive when we combine the sweet with the savory. I know at my house a fall menu requires some hearty flavors—elements like root vegetables, satisfying salads, and meaty main dishes. 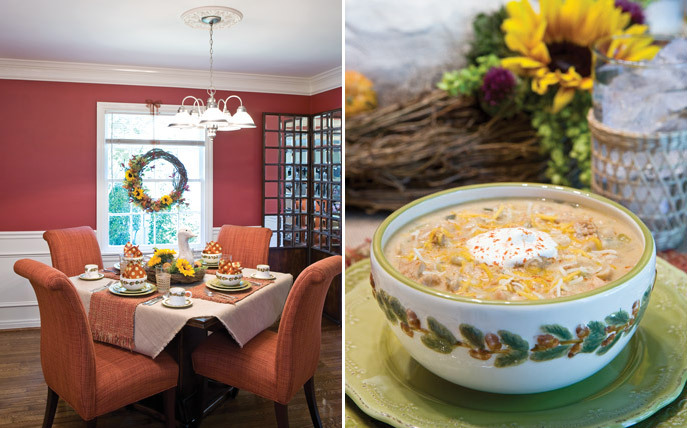 Thanks to Southern Lady’s recent special edition, Southern Recipes: Autumn, an entire fall menu can quickly be at your fingertips. They have included a variety of appetizers, side dishes, soups, and mains that recall Southern classics. If you’re looking for ideas for a fun and easy family night, Southern Lady has some lovely inspiration and tasty recipes! In a 2-cup liquid-measuring cup, combine 1¼ cups water, sugar, and yeast; let stand for 5 minutes. In the work bowl of a food processor, combine flour, rosemary, and salt. Pulse several times to combine. With processor running, slowly add yeast mixture and 1 tablespoon olive oil. Continue running processor until mixture is combined and forms a ball. On a lightly floured surface, turn dough out, and knead for 5 minutes. Place in a bowl coated with cooking spray, turning to coat top. Cover, and let rise in a warm, draft-free place (85°) for 1 hour or until dough is doubled in size. Preheat oven to 400°. Grease a baking sheet with 1 tablespoon olive oil. 1 tablespoon olive oil. 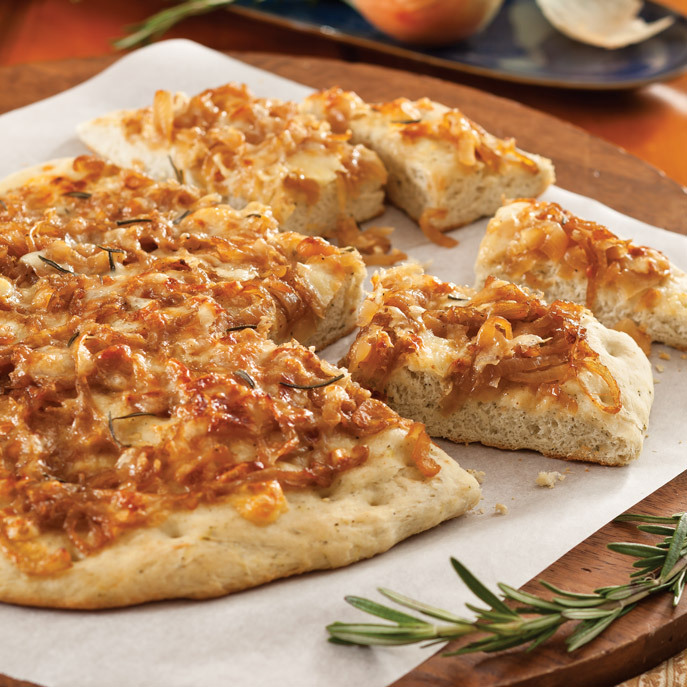 Top with cheese and Caramelized Onions. In a large skillet, melt butter over medium-low heat. Add onion; cover, and cook for 30 minutes, stirring occasionally. Remove cover, and increase heat to medium-high; cook for 10 to 12 minutes, stirring occasionally. Add vinegar, salt, and pepper. Cook until vinegar evaporates, 1 to 2 minutes. 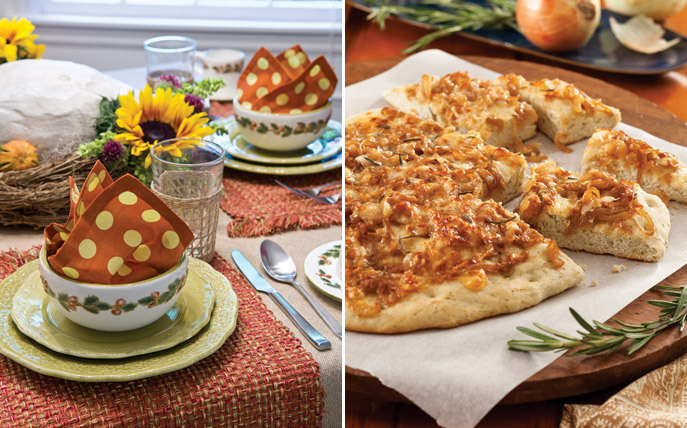 Fall is the perfect time for entertaining and I hope these recipes help ease your burden as a hostess, freeing you up to enjoy your company while sharing a lovely and memorable meal. What are your favorite savory recipes for fall? At this time of year, I am always anxious to make roasted butternut squash soup. With a splash of orange juice in the recipe, it is a combination of both sweet and savory. I am definitely going to make your focaccia bread to accompany the soup… Yum …. Can’t wait for the weekend. Thank you. My husband will love this recipe for focaccia…thank you Phyllis. I usually start my fall cooking with a vegetarian stew made with sweet potatoes, carrots, celery, onions, red lentils and warm spices. I call it my warm and cozy stew. I’m going to try that today, thank you for a new creation. The chili is the perfect thing to make when entertaining, the focaccia sounds like a delightful addition. When I entertain, I make simple, easy to make food, and spend my time creating a beautiful table for guests to enjoy. Thank you for the recipes, perfect! Many thanks for these recipes, Going to try them today!